Cho Chikun (Cho Chihun, Japanese: 趙 治勲, Korean: 조치훈, b. 20 June 1956 in Seoul, South Korea) is a Korean, professional 9-dan of the Nihon Kiin. He is sometimes referred as the 25th Honinbo, an honorific title given for winning the Honinbo title five times in a row. He currently holds the record as the Japanese professional with the most number of titles, career wins, and Honinbo titles at over 80, over 1,500, and 10 respectively. He is a force of great longevity in modern Japanese go, winning titles for over 35-years. Cho Chikun v. Kato Masao, 1981-09-09. 6th Meijin Final, Game 1. A bloody game with over 70-captures begins this title match. Cho Chikun v. Kobayashi Satoru, 1997-01-29. 21st Kisei Final. Cho shocks everyone by trying to live with W92. His intense reading power and shinogi skills allow him to surprise with moves like this. Cho Chikun v. Kobayashi Koichi, 2011-07-23. 1st Igo Masters Cup Final. Cho continues to successfully play his characteristic style and longtime rival, even into the 2010s. Cho Chikun was born in Seoul, South Korea in 1956. Before the Korean War his family had been upper-class and very wealthy due to his grandfather being a bank director. But during the Korean War, his father was forced to burn the family's money and so they became impoverished. His father then sought the advice of a fortune teller who told him to change Cho's name from Pung-yeon Chikun and that his son would become famous one day. Cho arrives in Japan in 1962. Cho's grandfather taught him go when he was young. Seeing great talent in him, his father sent him to Japan in 1962 at the age of six. His rise to becoming a great go player began when he joined Kitani Minoru's dojo. He was accompanied by his uncle, Cho Nam-ch'eol, and his brother Cho Shoen on his way to the Haneda airport in Japan in August 1962. At the airport he met Kitani and his wife, another pupil Kobayashi Chizu and the master's daughter, Kitani Reiko (who as an adult married Cho's future rival, Kobayashi Koichi). The day after arriving, the Kitani Dojo had a celebration for the sum total dan ranks of Kitani's students reaching 100, and Cho was allowed to play Rin Kaiho in a five-stone handicap game. A large crowd watched intensely and enjoyed watching the young Cho win his first game in Japan. Cho enrolled as an insei at the Nihon Kiin when he was seven. He was bullied by many other students for being Korean. He started to become annoyed since he was the Kitanis' "baby". He was known to be lax in his studies, which could be clearly seen when his future rival, Kobayashi Koichi, joined the Kitani school. Kobayashi was not as strong, but he studied much harder than Cho. He settled down somewhat when his mother, Oksun, came to Japan and comforted him. A crisis arose when his mother decided it was time to go home, but one famous incident that made Cho himself stick it out in Japan was when he was taken to the house of a wealthy patron of Kitani in Kobe, Takeoka Shiro (executive director of the Obayashi-gumi). Cho stared in wonderment at a huge picture of a tiger. Takeoka asked if he liked it, the boy said yes, and the patron said he could have it. Kitani intervened and said he could have it only if he reached professional 1d by age 10. In fact he made 1d at 11, but as soon as he did, Mrs Kitani phoned the patron and he said: I know what you're phoning for, it's on its way. Apparently that picture still graces Cho's home. It was probably Mrs Kitani who was most influential in keeping Cho in Japan -- she adored him and spoiled him when he was very young -- but the topic of a return to Korea was always in everyone's thoughts, including hers. He wore her out, he engaged in battles of will with her, and she more than once expressed misgivings to her husband about being able to give him a suitable upbringing. But one little incident that helped change the mood was taking him to Mitsukoshi to buy his first suit -- he was wreathed in smiles for a change. Mr Kitani volunteered to talk to Cho Nam-ch'eol about sending Chikun home, but he had another Korean pupil, Ha Ch'an-seok, who become a good friend of Chikun and the tribulations were tided over. In the end, it was Cho who made the major changes necessary to succeed when he did not make 1d at the age of 10. It spurred him on to become a ferocious student. The tag of being a "difficult" child began to fade, but he remained a person of great passion. He claims he thinks of death whenever he loses, and he cannot stand being second. But in his career, since then, he has not often had to accept second best. Cho became shodan after beating Michihiko Azuma? in May 1968. He set a record at the time for the youngest Japanese professionals, at 11 years and 10 months. In the same year, he was promoted to 2d and was looking very promising. Within two years, he climbed to 4d after winning almost every Oteai game. He reached 5d in 1971 at 15 years old. In 1972, Go Review and the Kido Yearbook released information on 'Cho Chikun,' though his name was well known even before the articles. He had a great record of thirty wins and six losses for the year, but lost twice to his rival Kobayashi Koichi in important tournaments. First, the 4th Shin-Ei, which was even televised, and second, the 16th Prime Minister's Cup. In the 9th Asahi Pro Best Ten tournament he had a rocky start, but gained momentum by defeating three top players, until he lost to Rin Kaiho, who was the Meijin title holder at the time. In 1973, Cho won the 5th Shin-Ei by defeating Hane Yasumasa, who was an 8d at the time. In the 5d+ Oteai, he won second prize after scoring an 83.75% winning percentage. He then took tenth place in the 11th Asahi Pro Best Ten tournament, and was promoted to 6d in with a solid record of 30-wins and 11-losses. His most significant accomplishment of 1974 was qualifying for the 22nd Nihon Kiin Championship by defeating Sometani Kazuo, Kato Masao, Ishida Yoshio and Rin Kaiho. His win against Ishida was something strange, as it came a week after Ishida held both Meijin and Honinbo titles. He didn't make it past the second game in the 18th Prime Minister Cup, which again went to Kobayashi. He then matched Kobayashi by defeating him in the 6th Shin-Ei. That year he was awarded a Special Merit Prize by Kido magazine after his most impressive record thus far -- 33-wins and 9-loses. In 1975, Kido magazine rated him as the number one, young player. His game was powerful and his endgame strong, but the evaluation of his true strength would have to wait. He barely lost out in the final of the 22nd Nihon Ki-In Championship after making a critical mistake against Sakata Eio. This loss fueled his determination to win the 12th Asahi Pro Best Ten, which he did with an undefeated record against a field of all 9-dans. The victory made him the youngest title holder ever in Japan and skyrocketed his popularity. He made it to the third round of the 1st Tengen league before losing to Ohira Shuzo. While the rest of his tournament year was quiet, these later months proved turbulent for him. No sooner was he promoted to 7d in late October that his teacher, Kitani, passed away in December. His record that year was 39 wins, 16 losses and 1 draw (a triple ko against Kata Masao). 1976 was a year of change. As well as having to cope with the loss of his teacher and regain his playing strength, the tournament landscape drastically changed. The Asahi Pro Best Ten and Top Eight Players tournaments were disbanded, being replaced by the Kisei and Gosei tournaments. This was unfortunate for Cho, since he couldn't defend his first two titles. And the Tengen was enhanced after the Nihon Kiin Championship and Kansai Kin Championship were combined. Nevertheless, after a bumpy start Cho would go on to have a positive year. He began by winning the 1st Asahi Top Eight Players tournament 2-1 against Fujisawa Hideyuki, and a place in the 2nd Meijin league. Then he failed to get into the 32nd Honinbo league, lost in the 2nd round of the Tengen league, and didn't make it past the preliminaries for the 1st Gosei. Things started looking up after he reached the semi-final of the 20th Prime Minister Cup, but fell again after losing in the 2nd round of the 1st Shinjin-O. He then spent some time reflecting on himself and returned with four wins in a row to reach the 26th Oza final. He continued his strong play and won the title by defeating Otake Hideo 2–1. It was his first title and he couldn't be happier. He finished the year out by reaching the 15th Judan challenger final. Although he didn't hold the best tournament record that year, he nonetheless won prizes from Kido for having the highest number of wins (46) and 'best technique'. His record was 46-wins and 18-losses. 1977 was a bad year for Cho. He lost in the preliminaries of the 2nd Meijin league, the 15th Judan and the 16th Judan. He then lost his only title, the Oza, in November. The only tournament he would win this year was the 8th Shin-Ei, which was followed by another loss to rival Kobayashi in the 2nd Shinjin-O final. After attaining the Meijin title, Cho returns home for the first time in 18-years. Cho looked much better in 1978. He won the 7d section of the 3rd Kisei before being promoted to 8d in the summer. He took 3rd place in the Meijin League. Even through some success of the year, he still couldn't make it through the preliminaries of the 33rd Honinbo. He participated in the 16th Judan, the 3rd Tengen, and the 26th Oza preliminaries. In 1979, Cho made good progress by finally making in through the 34th Honinbo preliminaries. However, his results in the 16th Judan and 3rd Tengen leagues were suboptimal. To make up he went 4-0 in the 4th Gosei league to make it to the finals. He defeated Otake Hideo 3-0 and won the title with an undefeated record. The year ended on another high after earning the best Oteai score of the year: 5-1. 1980 is said to mark the end of Cho's first phase of his career. He unsuccessfully defends his new Gosei title against Otake, but wins what he was long after: the Meijin title. Coincidentally, also against Otake. There were rumors which said that Cho vowed that after having moved to Japan, he wouldn't return to South Korea until the Meijin title was his. He made his first trip home during New Year's week of 1981 after 18-years. The twenty-four year old was treated as a national hero and given the chance to play two games with Korean champion Cho Hun-hyeon. One was a quick game, while the other spanned nearly 18-hours over two days. Cho Chikun won both games, and Cho Hun-hyeon vowed to never lose to Cho again. From 1981 to 2003, Cho Hun-hyeon never lost to Cho. Cho wins the year's Shusai Prize, Kido's Most Outstanding Player and ends with a record of 39-wins, 19-losses and 1-draw. In the January 1981, Kido Magazine published an in-depth review of Cho's career, including several statistics. The following table summarizes his results per year. Cho became a 9d in April after winning an Oteai game, thereby becoming the youngest Japanese 9d at the age of 24. He made an unprecedented run of 7-0 through the 36th Honinbo league and defeated Takemiya Masaki 4-2 to win the title. He successfully defended the Meijin title against Kato Masao. He finished the year with 36-wins and 10-losses. In 1982, along with defending his Meijin and Honinbo titles, Cho added another title to his collection -- the Judan title. This year he would face Otake Hideo three times in three title matches. With his Honinbo title he defeated Kobayashi Koichi 4-2 with three straight wins. He also made it into the final of the Gosei and Kisei. His year end record was 34-wins and 13-losses. In 1983, Cho won the 7th Kisei title in a turbulent match against Fujisawa Hideyuki to became the first player to hold the Kisei, Meijin, Honinbo, and Judan concurrently. He would hold all four for only forty days, but would replace it with another record of holding the Meijin title for four consecutive years. The other two titles, the 38th Honinbo and 21st Judan, are lost to Kato Masao and Rin Kaiho respectively, with Rin making his own comeback. The year could have been better, as he ended with 28-wins and 22-losses, but still held two titles. It was certainly a tumultuous year. In 1984, Cho defended the 8th Kisei title against Rin Kaiho through some fierce games. For the fourth time in five years, Cho faced Otake Hideo in the Meijin final. He went down three games again only to make another miraculous comeback with four straight wins to defend his title. He failed to make it into the Honinbo league and ended the year with a record of 27-wins and 19-losses. In 1985, Cho defended the 9th Kisei title against Takemiya Masaki in a series that went a full seven games. There was a dramatic final where Takemiya gained a huge moyo worth over 120-points. Luckily, Cho's sides and corners were just enough for a 1.5-point win. The theme of a huge moyo and last second, all-or-nothing invasion to live would become a regular for fans of Cho and Takemiya matches. At the same time, Cho's rival, Kobayashi Koichi, took the Meijin title from him after having held it for a record, five consecutive years. Unbeknownst to Cho, Kobayashi's win foreshadowed the years to come. Cho plays his opening move of the 10th Kisei title match against Kobayashi. A crowd of spectators and media applaud and record the memorable event. A shocking event at the beginning of new year. The first game of the 10th Kisei was planned for January 16-17, 1986. At around lunch time on January 6, 1986, Cho was leaving in his car when a motorcyclist came around from his blind spot. He had avoided Cho's car, only to have slid and overturned on his motorcycle. Cho helped the motorcyclist up, and when Cho went to pickup the bike a car hit him. His right thigh was broken and he suffered other injuries. He was sent into the emergency room and had an operation the day after. The injuries would take three months to heal. However, Cho was determined not to let it affect his upcoming Kisei match. Since his head and hand were fine, he went ahead and played the first game, losing only by 2.5 points to Kobayashi Koichi. Cho recovered from the loss and took the next two games. Kobayashi then took three in a row and won the title. For the first time in eight years the 29-year old Cho was without a title. He went on to lose in a playoff for the Meijin, but came back to win the 11th Gosei against Otake 3-0. His record was also one of his best in years, with 35-wins and 17-losses. During this period Kobayashi Koichi took off and was winning several titles a year, while Cho was struggling to stay in the game against him. Recovering from his car accident took longer than expected and affected the precision he once had in his byo-yomi play. It also seemed that Cho was going through some changes in his play style, suffered an identity crisis. Cho lost his Gosei title in 1987 to his friend Kato Masao. He also lost out on challenging for the Oza. Although losing out on two titles, he would win the Tengen from Kobayashi. The Tengen had a bigger prize than the Gosei and Oza, adding on the fact that Kobayashi was Cho's biggest rival was satisfaction for him. His record for the year was an impressive 40-wins and 23-loses. Cho played mixed games in 1988 -- it seemed his style was in flux. He won the 26th Judan from Kato and defended his Tengen against Sonoda Yuichi. The first international titles began with Cho being invited to the 1st Ing Cup. He lost in the second round to Nie Weiping. His record for the year was 28-wins and 18-losses. Cho ended 1989 with two domestic titles, just like last: he kept the Judan, lost the Tengen, and won the Honinbo. The Judan and Tengen were both against Rin Kaiho, while the Honinbo was a 4-0 sweep against Takemiya Masaki. (In fact, he would hold the Honinbo title for ten years, until 1999.) Cho was happy to hold the Honinbo once more, but Kobayashi still held to Kisei and Meijin titles. It was during this year that Cho's performance caused some of the media to refer to it as 'Cho's renaissance'. His record for the year was 29-wins and 18-losses. In another tough year, 1990, Cho defended the Honinbo against Kobayashi, but lost the Judan to Takemiya. Both matches were exhausting, going the full seven games. He held strong against rival Kobayashi but couldn't find an opening to defeat Takemiya. Cho was down to one title again and his record for the year was, for him, a below average 26-wins and 20-losses. 1991 was an awkward and disappointing year for Cho. While he successfully defended the Honinbo title again against Kobayashi, he lost the Judan challenge match, lost the play-off for Kisei challenger, and made no traction in the Meijin league. On the international scene Cho scored one of his few international titles with the 4th Fujitsu Cup, but only after his ill opponent, Qian Yuping, was unable to attend, thereby giving Cho a default victory. One of Cho's greatest obstacles preventing him from winning international titles was his infamous habit of blundering at critical moments. He also didn't make it very far in this year's Tong Yang Securities Cup. On the surface his match record looked better than the previous year's -- ending with 30-wins and 17-losses -- but it just went to show that wins without context meant little if they weren't the right ones. 1992 was another vapid tournament year. Cho defended the 47th Honinbo title again against Kobayashi with a miraculous comeback and lost in the semi-finals of the 2nd Ing Cup. Not much headroom was made elsewhere, while Kobayashi was holding three big titles. However, things were brewing just beneath the surface. Cho's play seemed livelier and he had one of his best match records in years, with 31-wins and 16-losses, he just needed to put them in the right places. This period marked Cho's return to top form and would be his longest period of success. He would hold the Triple Crown (Honinbo, Kisei, Meijin) for three consecutive years and the Honinbo title for ten, breaking Takagawa Kaku's 38-year old record. At that time he was the only player to do either. By 1994, he caught up with his rival, Kobayashi Koichi. 1995 was a particular bad year, but he come back with a vengeance in 1996 -- winning six titles and his first Triple Crown since 1983. He achieved the astonishing feat of holding onto the Crown for 1997 and 1998. And in 1999 he held the Kisei and Meijin titles. 1993 was the fifth year in a row Cho held onto the Honinbo title. As a result of the rules regarding the Honinbo title, he was bestowed the honorary title of 25th Honinbo. He would get far into the Tong Yang Securities Cup, losing to Yi Ch’ang-ho in the final. He then became a challenger in the Kisei. Another good record with 26-wins and 13-losses. Cho Chikun v. Kobayashi Satoru, 1997-01-29. 21st Kisei Final. Cho shocks everyone by trying to live with . His intense reading power and shinogi skills allow him to surprise with moves like this. In 1994, Cho defended the Honinbo and won the Kisei from Kobayashi 4-2. He then won the Oza for the first time in 17-years against Kato Masao. He ended the year with 33-wins and 19-losses. 1995 was a particularly bad tournament year for Cho. His only success was his continued defence of the Honinbo title for the sixth year in a row. In the Kisei final Cho played a striking number of mistakes and overly ambitious moves, thereby losing the title. For example, Cho resigned by move 69 in game two, and received two endgame upsets in games four and five. The Oza was taken away by O Rissei 3–0. His record for the year was a disappointing 31-wins and 25-losses. In 1996, Cho gained the Triple Crown once more -- he won the Honinbo, Kisei and Meijin titles. It was a tiring year for Cho. He played no less than 62 tournament games and won 45 of them. In 1997, he defended the Triple Crown in a dominant fashion, with a record of 4-1, 4-0, and 4-2 against Kobayasi Satoru, Kato Masao and Kobayashi Koichi respectively. He ended with 26-wins and 13-losses. And in 1998, he held his Triple Crown for the third year in a row and the Honinbo title for ten consecutive years, both unprecedented feats. His record for the year was 28-wins and 21-losses. The wins were in the right places. In 1999, Cho finally lost the Honinbo title, but held onto the Kisei and Meijin titles. He made it to the Oza finals against a powerful O Rissei. His record for the year was 31-wins and 21-losses. Cho crumbled in 2000. He lost the Kisei to O Rissei 4-1, the Meijin to Yoda Normimoto 4-0, and failed the challenge for the Oza against O Rissei 3-1. However, at the same time his great rival, Kobayashi Koichi, also lost all but one of his titles. The common narrative was that of an era coming to an end: the era of Cho & Kobayashi, 1980s to 2000. It's difficult to say why Cho suddenly lost all his big titles, but it was during this seemingly uncontrollable, downward spiral that Cho made one of his most infamous remarks. After losing his most prized title, the 25th Meijin, to Yoda by 4-0 he was interviewed by a reporter who asked, "Why do you like go so much?" He replied: "I hate go". He elaborated by saying his intense desire to win turned debilitating for him, esp. in two-day matches. The stress and tension are what led to his habit of ruffling his hair and constantly fidgeting. He finished the year with just one title, the NEC Cup. His record for the year was 29-wins and 29-losses, or 50%, one of the lowest in his career. It was strange to see Cho start a year, 2001, without any big titles. He came close to challenging for all of the Triple Crown titles, but this narrative wound up defining a majority of his tournament career throughout the 2000s. He defended the NEC Cup, and won the 34th Hayago Championship and 49th Oza. It was a tiring year for Cho. He ended with a positive record of 47-wins and 20-losses. In 2002, Cho won the 35th Hayago Championship and 9th Agon Cup, breaking Sakata Eio’s 27-year record of 64-titles. 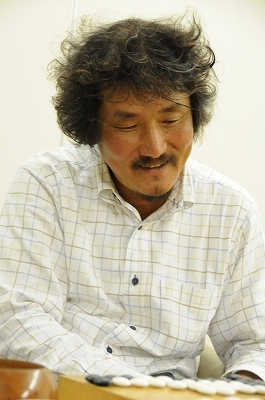 As of 2014, Cho still holds the record for the most number of titles in Japan, with over 80. He also made it the 50th Oza final against O Meien, where he made one of his most famous time blunders. Thinking it was his opponent’s turn, Cho didn’t play in response to the time-keeper’s countdown and lost the first game. He ended up losing the match 3-2. Cho also won the 8th Ricoh Pair Go Cup with Inori Yoko. His record for the year was 39-wins and 26-losses. In 2003, Cho would win his second and final big international title. Seeing as he always had difficulty at international events, it was a pleasant and joyful surprise for many go fans. In the tournament he would defeat fellow countryman Cho Hun-hyeon for the first time since 1981 -- recalling that after Cho Chikun returned home in 1980/81 and defeated Cho Hun-hyeon in an exhibition match, Cho Hun-hyeon vowed to never lose to Cho Chikun again. Cho also entered the quarter finals at age 47, while his field were all 18-21 year olds. As for the rest of 2003, Cho made it into the second round of the 8th LG Cup, losing to Yi Ch’ang-ho; the 1st JAL Super Hayago Championship, but lost in the first round to Hane Naoki; and won the Ricoh Pair Go Cup again with Inori Yoko. 2004 was a quiet year for Cho. He participated in the JAL Super Hayago Championship again and ended up winning against Mimura Tomoyasu. From 2005-7 Cho won the Judan title, his first big domestic title since the 49th Oza in 2001. 2007 started off well by Cho winning his first three important games. The first coming against Imamura Toshiya in a Tengen preliminary game, the second against Yamashiro Hiroshi in a Gosei preliminary, and the third against Ishii Kunio in a Kisei preliminary. They were all won by resignation and as a result led to some excitement by the press. He followed in the coming months by winning the 45th Judan for the third consecutive year. He ended up making into the semi-finals of the Tengen, and finals of the 32nd Kisei, played the following year. He reached the final of the 54th NHK Cup by defeating Yoda Norimoto and won the title against Yuki Satoshi. It was the third time he held the NHK Cup and marked the 70th title of his long and successful career. All of this only highlighted that Cho was still an active force to be reckoned with. In 2008, Cho won the 14th Ricoh Pair Go Cup with Osawa Narumi. And in 2010, he won the 1st Igo Masters Cup against his longtime rival Kobayashi Koichi. Overall, since the late 1990s Cho has regularly participated in all the preliminaries for the big domestic titles, reached the final of them several times, and continued to play in over approximately 40-games a year. He acquired 17-titles in the 2000s alone and won his second international title in 2003 with the 8th Samsung Cup. If anything, Cho showed longevity and perseverance through his continuing hard work and powerful play. Being up 3–0 in the Kisei final, it looked like Fujisawa Hideyuki would run away with the title – for a seventh time in a row. Cho left many flabbergasted after coming back to win three games to tie it at three apiece. It looked like Fujisawa had won the seventh game, but he made one of his characteristically famous blunders and Cho won. It was the end of the Fujisawa-Kisei era and left many to wonder, "whether any other player will be able to hold the top title for six consecutive terms." Cho made another miraculous comeback, this time in 1992 against his biggest rival Kobayashi Koichi in the 47th Honinbo. 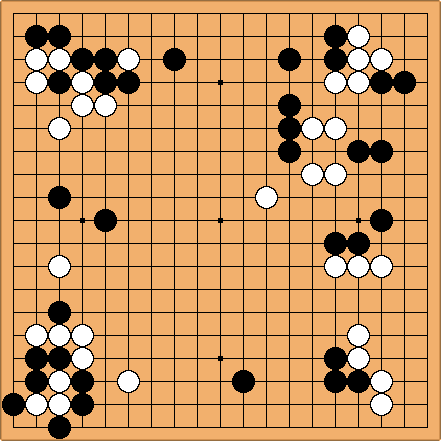 Kobayashi had challenged for the Honinbo in 1990 and 1991, but Cho was too stubborn to give it up. Cho had come back in both finals. In 1990, he was down 1-3, but pulled back three wins to defend the title. In 1991, he was down 0-2 in 1990, but did a reverse sweep 4-2 to defend once more. In 1992, it was even more unbelievable. Cho was losing 0-3, but played relentless for another reverse sweep 4-3 to keep the Honinbo away from Kobayashi's grasp. This certainly showed that Cho could come back from any deficit. Cho competed in 34th edition of the Hayago Championship in 2002. His campaign started against Hane Naoki. Taking black, Cho passed Hane by 5.5 points, Yoda Norimoto being his next opponent. Cho defeated Yoda by resignation while holding white. In the semi-finals, his opponent was O Meien, who he defeated by resignation also. The final match was against Cho's biggest rival Kobayashi Koichi. He won the match by 6.5 points, and it became his 62nd title. 50th Oza: Cho in disbelief from losing on time. In this match, Cho was determined to not let anything stop him from beating O Meien. By move 144 both players were in byoyomi. Cho had already planned move 145 and was looking into his lap in concentration. To his surprise, the timekeeper of the match, Yamamato Kentaro? declared O Meien the victor. Cho had been so deep in concentration that he had not noticed O play his move, thinking Yamamato was counting down his opponent's time. Greatly saddened, Cho kept asking himself "Why?...Why?" and repeating to Yamamoto, "Was it my turn?". After the incident, Cho left the room, crying. The referees finally decided that Cho, in fact, had lost, while on the board he was ahead. Cho competed in what would be the final edition of the Hayago Championship. Being the last year's winner, Cho was given an automatic berth into the second round. His first match was against his opponent for the final the year before, Kobayashi Koichi. Cho defeated him by resignation, before moving on and defeating Nakano Yasuhiro also by resignation. In both games he held white. In the final, he faced Ishida Yoshio. Taking black, Cho won by resignation after just 187-moves. This became Cho's 65th and record breaking title. The record of 64-titles in Japan was previously held by Sakata Eio, and was finally broken after 27-years. In the middle of 2002, Cho started in the 9th Agon Cup. He had never won the tournament before, but had a good record in hayago tournaments (16 hayago titles to date). At the time, Cho was holding the Oza title. His first match was against Awaji Shuzo, who he beat by resignation, holding white. His second match would be against fellow Kitani dojo student Ishida Yoshio. Taking black, Cho won by 4.5 points. The third match saw Cho taking black again, defeating O Rissei by resignation. His final match was against Cho U. This time taking white, Cho won by resignation. The 9th Agon Cup was his 66th title, and first time winning the title. 2003 was the year of the Samsung Cup. It was his first big title in three years. Cho was known for not doing well in international tournaments, so when he progressed to the quarter-finals of the 8th Samsung Cup, many were surprised. The only time before the Samsung Cup in which he won an international cup was back in 1991 when he won the Fujitsu Cup because his opponent, Qian Yuping, fell ill. The quarter-final was a historical game for Cho, as it was the first time he beat Cho Hun-hyeon since 1981. The final four were left now. Other than Cho, the other players who were Hu Yaoyu, Xie He and Park Yeong-hun. All were under the age of 21, while Cho was 47 at the time. In the semi-final, in which pairings were selected by lot, he played Hu Yaoyu. He was lucky, winning by only half a point. Park had defeated Xie He, so Cho and Park met in the final. Park won the first game by 4.5 points, but Cho came back and took the next two games. The last game was clearly worse for Cho until Park slipped up on move 180 and Cho was able to cut off a lot of stones. This led to Park resigning. Cho won his first international title in 12 years, and only his second of all time. In 2004, Cho competed in the 2nd JAL Super Hayago Championship. This time Cho started off on a high note, defeating Yokota Shigeaki by resignation, and then Yokota's fellow Kansai Ki-in player and current title holder Yuki Satoshi also by resignation. In his third match, taking black, he defeated old friend Kato Masao by 2.5 points. The final was against Mimura Tomoyasu. This time taking white, Cho defeated Mimura by resignation. This was Cho's 67th title, and first time winning the tournament. Cho found himself in the Judan once more, this time 14-years after his last bid as challenger in 1991 against Takemiya Masaki (Cho lost 3–2). The league consisted of old friends and rivals, such as Kato Masao, Rin Kaiho and Yoda Norimoto and some of the newer guns, such as Cho U, Takao Shinji and Yamashita Keigo. Keeping this in mind, it was not going to be an easy campaign for Cho. His first match was against Hashimoto Yujiro. Cho, holding black, won the match by resignation. In his next match, he found himself against another young powerhouse, Yamada Kimio. This time, holding white, Cho squeezed by with a win of just half a point. Cho continued his run, his next opponent being Hikosaka Naoto. Again holding white, Cho went on to win by 2.5 points. His next match was against Mimura Tomoyasu, of which he held white once more, and cruised past by resignation. His last opponent for the challenger final was Takao Shinji, who, on his way into the loser's section of the tournament, had defeated Kato Masao and Yoda Norimoto. Cho took white in the game, and won by 1.5 points. This made Cho the challenger for the 43rd Judan against title holder O Rissei. O had held the title for four consecutive years. The final would prove to be an exciting one, as the first match ended with a half point win for Cho. The next match was a win for O. The third match was a very large win for O, winning by 19.5 points, which is unusual to see in pro games. But this didn't stop Cho. He forced O into resignation by the fourth game. The fifth and last game would go Cho's way, with a 5.5 point win over O. This was Cho's 68th title and fourth time winning the Judan. Cho won the first game of the 44th Judan against the then newly crowned Kisei, Yamashita Keigo. The game was won by resignation. The second game went well for Cho, as he would apply his shinogi skills into Yamashita's moyo. There was a large fight in the bottom left corner early in the game. Cho won the game by resignation. In the third game, Yamashita started to fight back and knocked down Cho by 8.5 points. Yamashita still faced kadoban (one game from elimination). 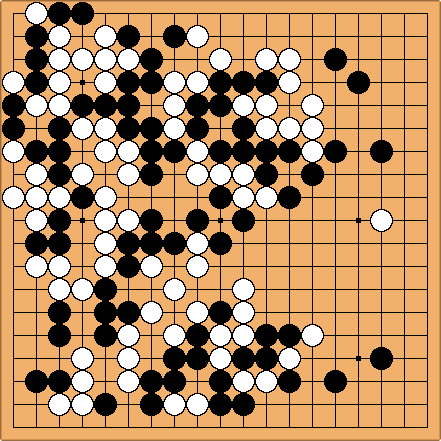 In the fourth game of the Judan, Cho kept control of Yamashita. He won by 2.5 points. Cho defended the Judan title for the first time since 1989. It was also his 69th career title. Cho won the first game of his second consecutive Judan defense against Yamashita Keigo by resignation. Cho won the second game by 2.5 points, while Yamashita won the third game by resignation. Cho lost again to Yamashita in the fourth game, before finally clinching the final game by 3.5 points while holding black, and thus keeping the title. Cho Chikun is a model territorial player, whose confidence is built on deep and thorough reading, his ability to switch between different territorial styles, and a joy for experimenting with new positions. Up to the early 1980s he would try to develop rapidly even at the expense of creating thin positions. He usually became involved in running fights with a number of weak groups under attack. As such he became a master of shinogi (rescuing weak groups). As his career progressed his territorial style grew to encompass a more steady, slow-paced game; and as he learned to split the game up into a number of skillfully coordinated, smaller fights his play developed a new depth. He is well known for his flexible and amorphous style. When Cho won the Meijin title in 1980 he said: "I try to match strength with strength, lightness with lightness. My ideal is to play in such a way that no one can tell who the player was." Furthermore, "Broadly speaking, my go perhaps belongs to the profit-oriented school, but there are various elements in my game and it is somewhat chaotic. I have no special preference in the fuseki and if possible I would like to master every style." 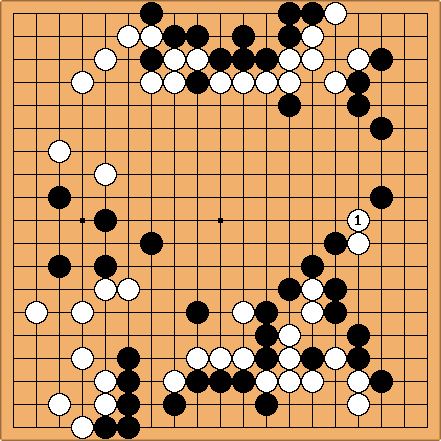 Cho is a player who tries to read everything out, thus often finds most of his time used in the first fifty moves. Yet Cho rarely falters once in byo-yomi. Abe Yoshiteru, who often played fast games with Cho, once commented "By the time I work out that the position looks like a ko, Cho has already finished calculating all the ko threats." What's phenomenal about Cho is his abil­ity to play for two days [the length of a title match game] without a single lapse of concentration. Then there's his intensity: his ambitious openings, his sharp middle game, and his uncompromising endgame. Sometimes his intensity does him in, because he's always playing at the ragged edge. Some­times he digs his own grave, but if you wait for that to happen, you'll never overcome him, especially not in a multiple-game match. To defeat him you need to muster even greater intensity, both on the board and within your­self. Cho belongs to the school that stresses the opening, and he is very good at it. The reason Cho lavishes so much time on the opening is probably that he sees the opening as having a direct effect on the outcome. Cho's influences are Honinbo Shuwa, Go Seigen, Kitani Minoru and Sakata Eio. From Shuwa and Go he admired their flexible style and fuseki. From Kitani he admired his slow-moving, yet irresistible power. From Sakata he admired his analytic flexibility: the type who will try anything if he decides it can be read out. Cho Chikun and Kobayashi Koichi were both students of the Kitani dojo. Although Cho entered three years earlier, Kobayashi became a professional one year earlier and even though he was nearly four years older. Even early on in their careers a rivalry was noted between the two, with Kido sponsoring a Three-game Rivals Match between the two in 1977. By that time they'd already faced off in a number of minor title finals. But Cho took off by winning big titles first. Kobayashi's first big title, the Meijin, was taken away from Cho. They also both fought back and forth on the Kisei. However, their most contested big title has been that of the Honinbo title. In fact, Kobayashi can put most of the 'blame' for not winning the Triple Crown (Honinbo, Kisei and Meijin) on Cho, recalling that Cho held the Honinbo title for 10 consecutive years from 1989-1998, nearly the entire time Kobayashi was also at his peak. Between Cho and Kobayashi, they really had a monopoly on the 'big three' titles. As such they were each other's most dangerous opponent. In an interview before the 47th Honinbo match in 1992 Cho commented about Kobayashi's first Honinbo challenge, "At that time there was a difference in strength between us, so the result was understandable. Looking at it impartially, Kobayashi is now probably stronger than me." However, when a reporter relayed this message to Kobayashi he replied, "Cho's just being diplomatic. I've played many professionals up to now, but my opinion remains unchanged: Cho's the strongest. His knack of playing moves that are without parallel and his severity in the fighting are something new in go." Games between these two rarely follow established patterns. The reasons for this are four fold. First is Cho's penchant for playing experimental moves. This allows him to use his intense reading to his advantage and keep games interesting to him. Second is Cho's perfectionist tendency towards the opening. If the reading reveals even the smallest defect or slightest personal distaste, Cho will try his best to find another variation, no matter how unconventional. Third is Cho's fighting style coupled with Kobayashi's attacking style. Fourth is both player's profound reading abilities, which reveal surprising moves at different points of the game. Cho's usually arrive in the opening and during complex infighting; Kobayashi's usually arrive towards the late opening to late mid-game. Cho's come from his obsessive-like reading and perfectionist openings, while Kobayashi's come from his flexible, long-term positional analysis and strong endgame. Contrasting the two more precisely: Although they both play a territory-oriented style, Cho has a fondness for shinogi strategy, Kobayashi for playing aji-keshi moves to secure positions; Cho tries to seek truth on the go board, Kobayashi seeks the most pragmatic way to victory. Cho has owned and taught at his own go dojo. It has served as a go club for many aspiring amateurs and live-in location for his pupils. As with most go schools it followed a schedule. The following account is from a western student, Dragos Bajenaru, during 1997-8. Each student competes in a league, with the stronger players playing fewer games. Two different time limits are used in the league games: one-minute per move and 10-seconds per move. The players can play any numbers of league games a day, but since it's point-based it benefits most players to play more games. The league's rating system is based on the players' winning percentages. The handicap is based on a three tiered system. In one-minute games, 10-seconds are removed for each stone down to 10-seconds per move, then a reverse komi of -3, -5, and -8 are added, and finally handicap stones are used. In 10-second per move games, only the latter two are used. Some of Cho's best students have included: Kim Shushun 7d, Takehisa Matsumoto 7d, Atsushi Tsuruyama 7d and Mitani Tetsuya 7d. 2004: 2nd JAL Super Hayago Championship? Reached career win 1000 in 1999, win 1200 in 2005, and win 1300 in 2008. Nine time winner of KIDO magazine's "Most Outstanding Player". Nine time winner of the Hidetoshi Prize?. Eight time winner of the Shusai Prize. Journalist Club Prize? winner in 1986. Honorable citizen of Chiba City award winner in 1996. Go World Iss. 91, p. 72. Behind the Scenes at the Meijin by John Fairbairn (9 October 2000) from the now defunct Mindzine. Go World Iss. 50, p. 24. Go World Iss. 23, p. 25-6. Go World Iss. 31, p. 30. Go World Iss. 79, p. 49. Tournament Go 1992 (1996) by John Power, p. 69. Cho and Kobayashi Koichi have played 129 official games against each other, as of November 2014. The 34th Hayago Championship final match (2001) was billed as their 120th game together. Cho has been the champion of the two-day matches. Between 1980 and 2000 he won nearly 50% of the big three Japanese titles (Kisei, Meijin and Honinbo). He is the first person to have held all three of these titles simultaneously. Cho has shown great longevity as a professional, winning titles for over 35-years. He won the 8th Samsung Cup at age 47 and the 45th Judan at 51. In 2011, he continued to place in the top ten in tournament winnings among Japanese professionals. In 2012, he reached the finals of the NEC Cup, Daiwa Shoken Cup and Igo Masters Cup, but lost to Takao Shinji, Iyama Yuta, and O Meien respectively. In 1975, he became the then youngest player to win a Japanese open professional title by beating Kato Masao in the Pro Best Ten (a record since broken). In December 2003, Cho, at the age of 47, won the 8th Samsung Cup. His victory marked the end of a fifteen straight, international title streak by Korean professionals. In 2010, Cho won the 3rd Yugen Cup, an unofficial tournament. In September 2012, Cho became the first Japanese professional to win 1,400 career games. A very in-depth biography and more than 1,555 games of Cho's: http://rongen17.home.xs4all.nl/Cho/index.html. Wikipedia article adapted from Jan van Rongen's biography: http://en.wikipedia.org/wiki/Cho_Chikun.